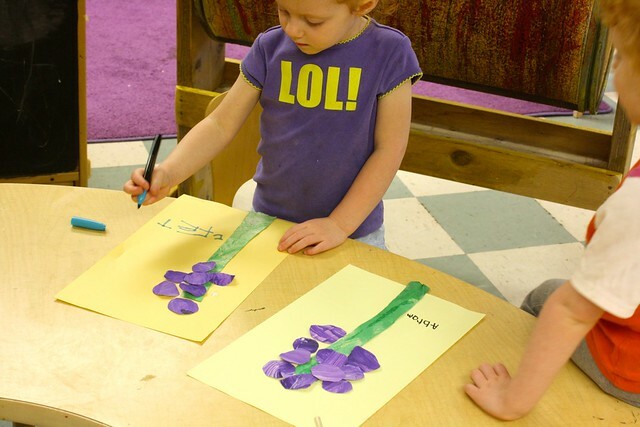 when it was V week, we talked up the color “violet” and made some replicas of the grape hyacinth. 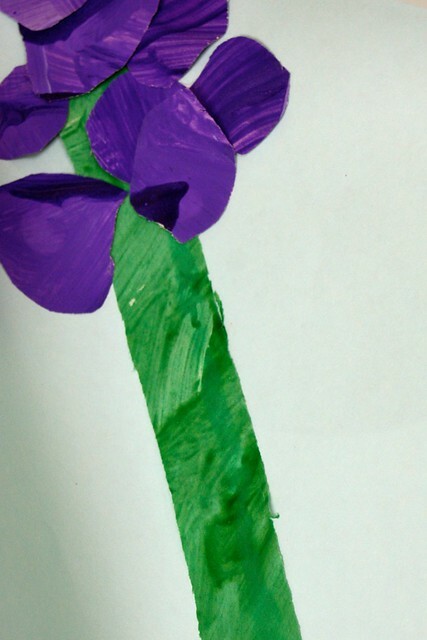 the days included trips around the church yard to find this pretty violet colored flower. 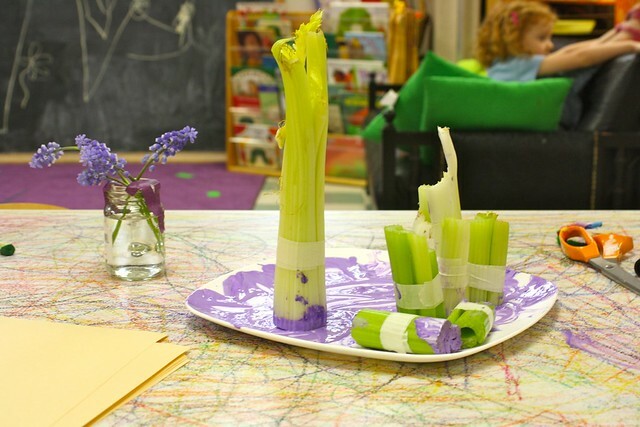 one project was using old vegetables (celery!) to make prints. 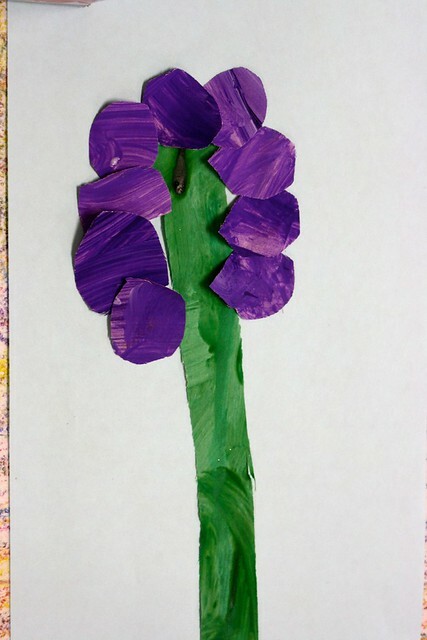 to make one bunch go farther, i cut the stalks into smaller pieces and masking taped them together. they lasted for days. 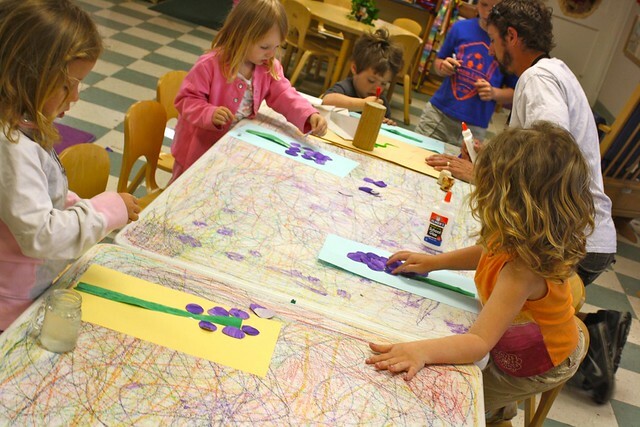 what you may not be able to tell here is that we had white paint and dark purple paint for the children to mix and stamp from. 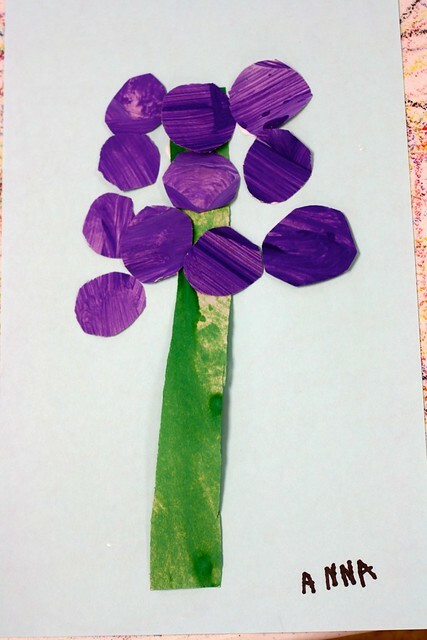 there was some careful stamping to make the blooms stick right on the crayon-drawn stems like the real flowers. another project was using old painted paper we had (my, how i much prefer to use painted paper instead of colored construction paper!) 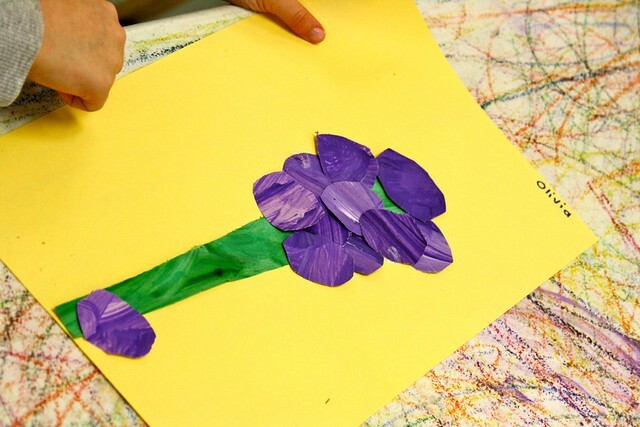 to make the flowers. as you might imagine, we looked at the work of eric carle first (and how handy for V week that the caterpillar was VERY hungry). 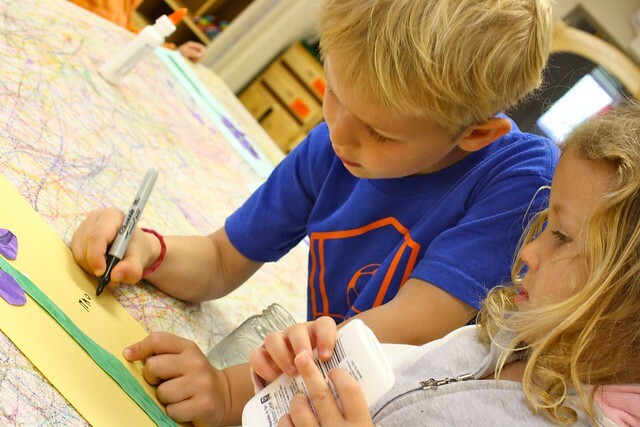 then there was cutting and gluing and name writing in the treasured permanent markers. there was even one preK friend who determined himself to be official name writer. thankfully, he had many willing friends. spring has sprung indeed and the flowers remind us so! What a great idea! I’m going to do this with Ellery today! So cute! 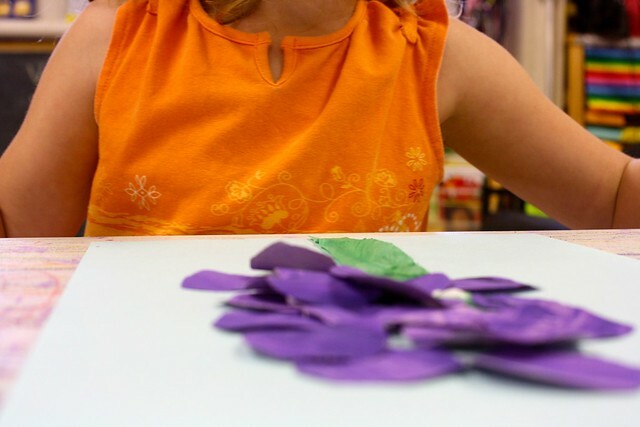 I love that you focus on one subject and do lots of activities with it. Love love love! oh, the many reasons I follow your blog. 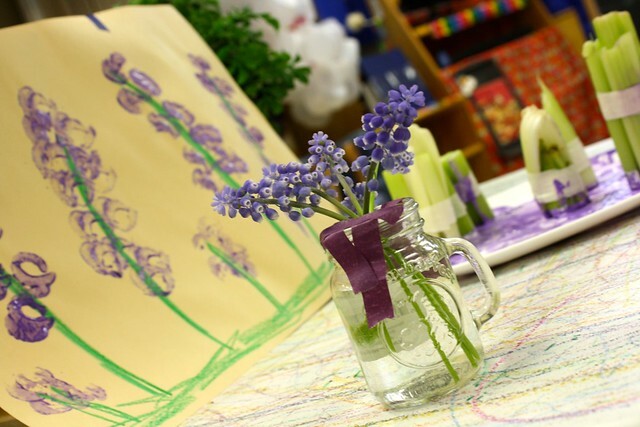 this post is one of them : ) i will be sure to post about the floral inspired art we’ve been doing this week so that you can see how absolutely relevant this post is to our curriculum. great ideas and as always, great photos. 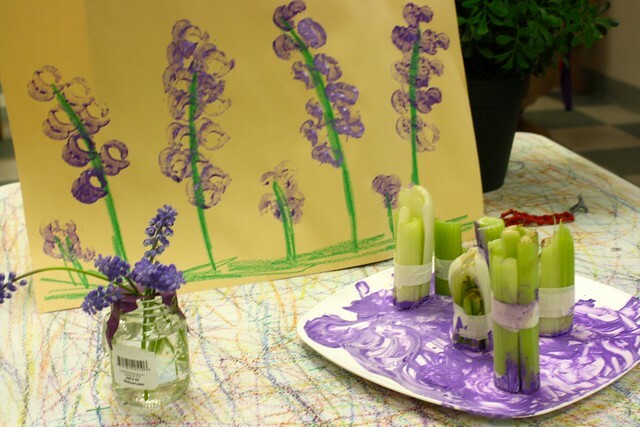 and thanks for the great tip about taping the celery–wouldn’da thought of that!. Love the texture the celery makes! What a great way to use old paintings to create new art. I am always looking for ways to use my boys’ precious artwork so it doesn’t just lay around stacked on top of the fridge.